From Wiki: Borrelia burgdorferi is a bacterial species of the spirochete class of the genus Borrelia, which has a double-membrane envelope. B. burgdorferi is predominant in North America, but also exists in Europe, and is the agent ofLyme disease. 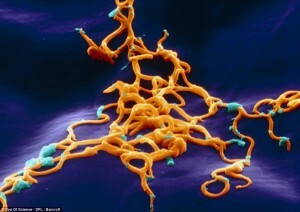 As pretty as a picture but a lot more deadly: Killer diseases as youve never seen them before | Mail Online. This entry was posted in Lyme Disease and tagged bacteria, Borrelia burgdorferi, diagnosis, disease, health, image, Lyme, magnified, tick. Bookmark the permalink.